When it comes to professional wrestling, it definitely takes two to tango. Much like in other forms of entertainment, any given protagonist is only as good as their antagonist. Sherlock Holmes had Professor Moriarty, Batman has the Joker, and James Bond has Spectre. It's no different in the world of sports entertainment, where legendary rivalries not only make for spectacular matches, they out and out define the sport itself, and shake the foundations of the industry. One of the main tenants of pro wrestling is that the audience should ideally be emotionally involved with the events in the ring. While this can be accomplished in just one match, the longer a rivalry goes on and the more heated it grows, the bigger the emotional resonance with the audience and fans. 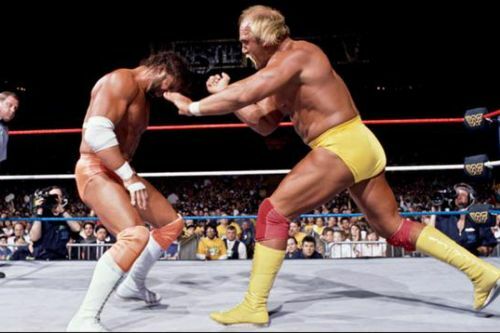 Here are ten pro wrestling rivalries so good, they became legendary. Greg Valentine has Roddy Piper down, but not out, in one of their infamous dog collar matches. Professional wrestling doesn't have an offseason, and your average sports entertainer is on the road far more often than he or she is not. Their bodies endure enormous punishment, despite the fact that wrestling is choreographed and scripted. But even in the world of pro wrestling, some tough people just stand out for being extra, EXTRA tough. The two men involved in this legendary rivalry are two such personages. Greg The Hammer Valentine was trained for the ring by Stu Hart in his legendary Dungeon. Known as a stiff worker with good technical acumen, he is a true legend in the sport and has wrestled all over the world. Rowdy Roddy Piper worked his way up to the ring by cleaning arenas and setting up the ring to pay for his training. He was also a student of the legendary Judo Gene Labell and performed many of his own stunts during his movie career. The rivalry started when Greg Valentine targeted Piper's ear during a match, partially deafening Hot Rod. Since the two men wouldn't stop pummeling each other, the NWA made their match a Dog Collar Match at Starrcade 1983. No title was on the line; they really just wanted to destroy each other. The match itself was brutal and featured virtually no scientific wrestling. It proved to be so popular, the pair would re-enact the match many times throughout the NWA territories. Here is a video of Valentine and Piper discussing their infamous match. You can watch the actual bout on the WWE Network. Where Will Kenny Omega Go?